Six months: the amount of time Royce and I have almost been married. Six months have gone by since we said "I do," and yet, I still stuck in stuck in the middle of an identity crisis. Yes, you read that right. No, this isn't a six-month married, quarter-life crisis. It has very little to do with being married at all. In fact, being married is pretty darned enjoyable. Except for one part of it: the new last name. Don't get me wrong. I love being an O'Neal. Kaitlyn O'Neal has a nice ring to it, and it seems to roll off the tongue easily. Well, everyone's besides mine. 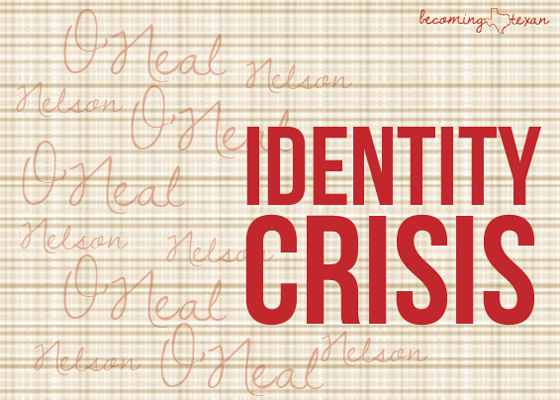 It is getting easier, but I still catch myself introducing myself as Nelson instead of O'Neal. If only botched introductions were my biggest concern. If only... But instead I am haunted by my incomplete name change every time I open an email, check the mailbox, go to the store, buy a plane ticket. Kaitlyn Nelson is still alive and well, people, and that's because the process of changing your name is ridiculous. Before we got married, the idea of changing my last name was exciting. Then reality hit after the honeymoon, and I quickly came to terms with how much of a pain in the rear end it really was. For example, I couldn't get frequent flyer miles recorded on my account because my driver's license name had changed, but I hadn't updated my frequent flyer account name. Easy fix, right? "People get married every day. It can't be that hard to change your name." Well, I thought wrong. American Airlines needs you to fax in a copy of your marriage license and social security card. Southwest Airlines needs you to mail in a copy. National Car Rental - mail it in or fax it in. Credit cards. I get it. You don't want your name to be easily changed. I totally understand, but why on earth do I really need to provide you with EIGHT pieces of paper to get my name changed?! This is asinine. Maybe I'll just keep them as Nelson for a few more years. Here's my major problem though: all of these accounts are tied to my social security number, which in order to get my name changed on anything else, I had to get it changed on my social security card first and foremost. Why can't all of these accounts (per my request) just look up that the name attached to the social security number has changed? Wouldn't that be simple? Think of all the paper, stamps and faxes that would save. Most of all, think about the headaches it would prevent from newlyweds like me!